Gaawwwd, this season is a lovable one. Spring's bringing some serious heat in the form of actual heat, events all over the city, and elevated moods for those of us enjoying it all. The Spring Cleaning event at The Stockist is yet another way for us to take it all in. This Friday from 6 to 9pm, stop by our fave boutique for shitloads of quality goods at 20% off [yessss]. Helen and Co. will be cleaning out the old to make room for the new [a.k.a. stellar summer stuff, we assume]. 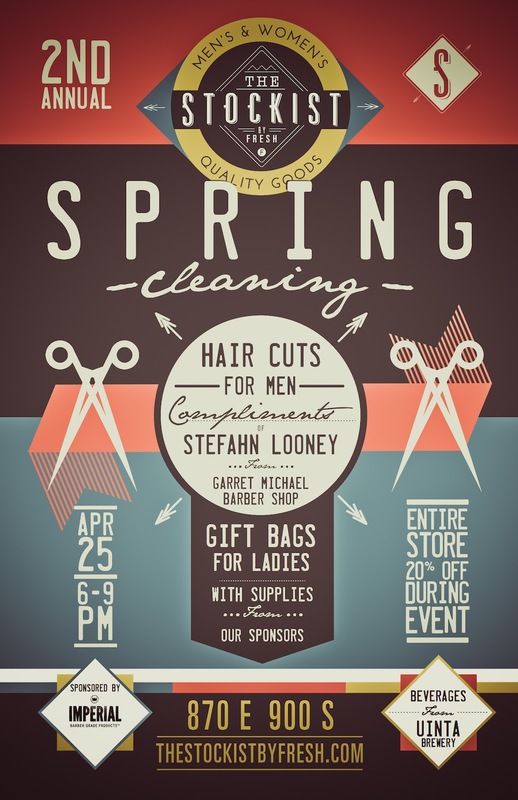 For those wise enough to head in, a healthy discount on everything in the store will not be your only reward: Stefahn Looney of Garret Michael Barber Shop will be doling out complimentary hair cuts for gents, and ladies will be supplied with gift bags. See the flyer below for details, then wend your way to 9th & 9th this Friday eve.